William Ford was born as long ago as 1853, the oldest of six brothers who have entries on CricketArchive. The youngest brother, Francis, was the most accomplished cricketer and played under Andrew Stoddart in all five Tests in Australia in 1894/95. All six siblings were at Repton College and, as far as I can see, Cambridge University. William and Augustus, as well as Francis played for Middlesex, but none of them played very often. For William there were only seven county appearances in fifteen years, and just 25 First Class matches altogether. He seems to have been a versatile cricketer though, his batting bringing him four half centuries. There are a couple of stumpings to William’s name, so he must have been an occasional wicketkeeper, and 13 wickets with a style described as round arm right arm slow. Clearly a part time bowler more than half of those wickets, including 6-56 in the first innings, came for the MCC against Hampshire in 1881, his only First Class match of that particular season. As a batsman William, who was a big tall man, was renowned as a powerful hitter. As so many of his ilk do it seems he got bigger as he got older, and one suspects that he took to wicketkeeping as it became harder to find somewhere to hide him in the field. He was nicknamed ‘Tree’, a legacy of an innings when he broke a number of bats (in one version of the story it is two and another four) prompting a wag in the crowd to suggest someone should equip him with a tree. Outside the game William was a schoolmaster. He spent almost a decade at Marlborough, then as now one of the more prestigious English Public Schools. After that there was an emigration, to New Zealand, where he was the headmaster of Nelson College, and he played a couple of First Class matches for Nelson whilst he was there. Ultimately he cannot have been overly enamoured of the Shaky Isles as by 1890 he was back in England. His most memorable feat whilst at Nelson seems to have been an occasion when he struck a ball into the Pacific Ocean, a carry said to be at least 140 yards. On his return there was another headship, at Leamington School – it was a position he left in 1893 to earn a living from writing about sport. He was 40. It may be, although I rather doubt it, that cricket writers earned good money in the 1890s, but I would have thought it rather more certain that head teachers would have done very well financially. I suppose there may have been an inheritance that rendered the need for a regular salary redundant, or perhaps Ford was dismissed from his headship and had no choice but to eke out a living from the game. He did write a book, A Cricketer on Cricket, the title of which raises the hope that it may have some autobiographical content, but in fact there is none. There is something of Ford’s life in an interview published in 1899 in Cricket – A Weekly Record of the Game, but despite his days as a cricketer being behind him by then there were no questions at all about Ford’s life outside the game. So why write about Ford in the 21st century? Little of his work was published in book form, and those articles he wrote, especially for Wisden, tended to be about schools cricket. It may be that had Ford lived longer (he died in 1904 at the age of 50) his pen may have won him a greater reputation, but as it is he largely a forgotten figure. A Cricketer on Cricket was published in London in 1900. It is something of a mixed bag in terms of subject matter, but there are two interesting chapters, so much so that they are well worth looking at more than a century after they were written. The subjects are related, the first representing Ford’s thoughts on the then current issues within the game, and later his vision of how cricket would look in a hundred years time, so in the year 2000. As to the state of the game in 1900 Ford showed himself to be pretty conservative. It is worth remembering that this was around a decade into the so-called ‘Golden Age’, when the grip that ball had long held over bat had been loosened considerably. Pitches had improved, as had the techniques of batsmanship, and some were clearly questioning whether the balance had tilted too far. Ford himself was not convinced that it had, and he made the point that, then as now, the spectator, particularly the casual one, went to cricket matches to watch batsmen bat rather than bowlers bowl. The first issue that exercised Ford’s mind was one that has recently come back into vogue as a suggestion to improve Test cricket. Should the visiting side be given choice of innings as a matter of course? Ford clearly acknowledges the merit in that idea, but ultimately comes down against it, on the basis that he was concerned, no doubt bearing in mind the thinking of the time that the side winning the toss should always bat first, that such a move may lead to pitches being under prepared. He does however concede one point that many would say has blighted the game for years; My argument is more sentimental than logical, of course, but then there is more of sentiment about cricket than there is of logic. Ford goes on to deal with the question of whether the height of the stumps should be increased, or an additional stump added. Clearly giving the bowler a larger target would make his job easier, and Ford had some sympathy with the idea, but he came to the conclusion that until wickets were uniformly of a high standard the risk of upsetting the balance by such a move was too great. Interestingly when the problem of the bat’s dominance over the ball became even more troublesome in the inter-war period the dimensions of the wicket were increased from 27 inches by 8 to 28 by 9 in 1931. The change has endured despite Australian concerns, but it made little difference on its own, and four years later the ‘new’ lbw law was introduced, something Ford had not considered. Whilst on the subject of size it seems that another question that exercised cricketing minds towards the end of the Victorian era was whether legislation should require bats to be narrower. Ford was no more enthusiastic about this idea than he had been about making a change to the size of the bowler’s target, and for the same reasons. I have no recollection of any serious debate about the width of bats in my time as a cricket follower, but it seems to have been an issue in the past. One observation that Ford did make was that he would favour a return to the days when umpires carried a gauge with them, so they could check that all bats were not too wide, so clearly attempts to deceive the umpires were commonplace, suggesting perhaps that contrary to Ford’s belief a modest increase in the width of his bat did reap rewards for the batsman. A vexed question in Ford’s time was in respect of declarations. Until 1889 a captain wasn’t allowed to close his side’s innings at any time, and it led to some contrived situations at times. The law changed that year to permit a closure at any time on the final day. That was progress, but there were still arguments and Ford was in favour of further liberalisation of the rule and indeed shortly before his book was published MCC did sanction a further change to allow an innings to be closed at any time after lunch on the second day. The declaration issue was related to the desire to avoid the draw, and here Ford had a novel idea for something else to graft on to the declaration law. He favoured a novel twist to the final day declaration that has certainly never been tried nor, as far as I am aware, ever been advocated elsewhere. His idea is best illustrated by an example, thus if a captain declared his second innings with four wickets down, and 200 in front, the side batting fourth would have to get to 201 with four or fewer wickets down, so 199-3 would be a draw, 200-4 a tie, and 201-4 a win. Ultimately the idea serves only to show just how unfamiliar the game was with the concept of the declaration, as it would also mean, although Ford seems not to realise, that if the chasing side slipped to 50-5 they would have lost, notwithstanding that Ben Stokes and Jonny Bairstow might be lurking in the lower order, well able to rescue the match as a contest and a spectacle. The most bizarre of the ideas that Ford looks at is certainly one that I have never heard anything of before, nor do I ever expect to, but clearly it must have occurred to more than just Ford at the time. I know little of Baseball, but there was a short lived attempt to bring the sport to the masses in England in the 1890s. A professional league lasted just a season, but the game was still being played in 1900. In addition major cricket tours had gone from England to the US, and in 1897 the first of three sides (the others visited in 1903 and 1908) from Philadelphia had toured England. None of the tours included any Test matches, but the Philadelphians won quite a few matches against First Class opposition and there must have been many on both sides of the Atlantic who took an interest in both sports. Against that background there was clearly a school of thought in the 1890s that believed that one way ahead for cricket was to ape baseball by introducing a change of innings after the fall of three wickets. 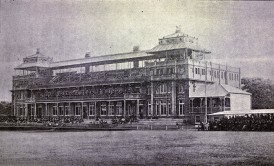 The reasoning seems to have been that the introduction of such a rule would help to even out the effect of difficult conditions, thus both teams would have to take their share of a sticky wicket and an evenly balanced match would not suddenly become a foregone conclusion by virtue of a shower of rain. Ford was against the idea, although not necessarily for the reasons I expected. His rationale seemed in the main to be along the lines of the batsmen being the game’s great draw card, and that to force a batsman to play himself in more than once would interrupt the entertainment and slow the game down. One or two of these ideas come back in Ford’s vision of the future, an imaginary scenario where he finds himself at Lord’s in the year 2000. A surprising number of his expectations have been borne out, although one or two have proved to be rather wide of the mark. Ford looked first at the ground itself, and talked of the famous old pavilion. Ford would have seen the building going up, as work was completed in 1890. That the building would survive was not a difficult call, but in addition he talked of a gigantic series of stands surrounding the rest of the playing area, accommodating some 30,000 people with ease. In 1900 there was the old Mound Stand, then a fairly new structure, and one other ‘grandstand’, although that would be regarded as something of a misnomer now. The remainder of the playing area was bounded by areas of covered seating. In 2016 the capacity of the ground is 28,000, so Ford did pretty well there. Ford’s next observation needs to be looked at in the light of the state of broadcasting in his time. Wireless telegraphy had just been invented, but any sort of commercial broadcast was twenty years away. Television was even further in the future and whilst photography was well established the so-called moving picture had barely been around five years, and it was only in the same year that Ford was writing that the first ‘film’ appeared. Against that background Ford foresaw a curious tower with steel poles. This is described as a wireless telegraph which connects us direct with all the major cricket grounds , and automatically registers the scores on those two huge screens. The amount of information on the boards meant that evening papers or scorecards as a means of keeping up to date were redundant, but there was no suggestion of any sort of radio commentary or moving pictures of the play. A major change in Ford’s vision of the future was in relation to wickets. No longer were these made of turf, although what they were made of was, apparently, a closely guarded trade secret. In any event whatever it was the pitch came in a number of slabs, and was laid rather like the slate on a snooker table. The idea was to create uniformity and a constant balance between bat and ball. We have of course had ‘drop in’ pitches, and the rules about the covering of pitches has seen the end of the old ‘sticky dogs’, but the variety of surfaces and the manner in which they wear remains with us, thankfully. Another factor in Ford foreseeing the demise of the sticky wicket was his expectation that by the year 2000 there would be a cover that would, in the event of rain, quickly cover the entire playing area. The rollers that carried the covers across the ground at such speed were driven by liquid air. We don’t have those covers now. They have been tried, most notably the ‘Brumbrella’ that was used at Edgbaston for a couple of decades, but the problem of the pitch ‘sweating’ was never satisfactorily resolved. The changes that the 21st century incarnation of Ford saw in the game’s equipment bring a smile to the face. He noted that bats looked exactly as they did in his time, but that on closer inspection they turned out to be made of an aluminium-steel amalgam – Dennis Lillee would presumably approve. English willow had apparently run out, and no sort of overseas willow that was up to the job was ever found. That change to the bat apart Ford found no significant changes in equipment, other than improvements in the quality of the materials used in their manufacture. The most bizarre change that Ford foresaw was in the way the game was played. To understand his prediction a little context is called for. In 1900 the cornerstone of the English game was the County Championship. There were 15 First Class counties that summer, a near doubling of the number who had competed for what is now generally recognised as the first County Championship, that of ten years before in 1890. By 2000 Ford, understandably in the circumstances, believed that almost all counties would be First Class. What is not clear is whether he saw a spread of the game at the highest level to Wales and Scotland, but without them there were a total of 48 English ceremonial counties, and another 36 if they were included. It seems the thought of a multi-divisional Championship in those circumstances never occurred to him. The problem would then arise that many more games would have to be played. On the one hand this would be no problem, as transport links in 2000 would be so good as to remove that as a problem, but it did mean that in order to have three matches each week the duration of each would have to be reduced to two days. In 1919 there was an ill-starred attempt at two day Championship matches, with longer hours, but Ford saw a different way of getting results. In his world all batsmen had to retire once they had scored 30, but there was a twist. At the end of the fourth innings all those who had got to 30 could come back in and bat again, twice if they’d got to 30 in each innings. Would that really shorten games to two days on these uniform wickets, even taking into account that there was some help for the bowler built into them? I’m not sure, but there were other twists to the game. First was a three foot high fence round the boundary – clear that and you got a six, but if you merely struck the ball into the fence it was two plus everything that was run. That move wouldn’t change too much, but the other was a curious one. Bowlers run ups were limited to six paces, so over rates would be good, but there was another feature. The closing years of the 19th century saw several throwing controversies, a problem which Ford’s new world had got rid of. The solution was a simple quid pro quo. The bowler lost his run up, but in return he could throw the ball. Perhaps Ford looked at the change from underarm, to round arm, to overarm and saw the legalisation of throwing as the ultimate destiny for bowling. William Ford was, of course, a man of his times, but his attempt at being a visionary is something it is interesting to look back on more than a century later. He had some very odd ideas to go with a few sensible ones and overall I for one am glad the game is the way it is, rather than the way Ford foresaw it.